Free speech is becoming a hot-button issue on social media platforms as of late. While free speech is still well-defended from a legal perspective, many individual social networks, like Facebook and Twitter, have begun to police their users much more heavily, which has led many users to seek less-censored alternatives. That's where Gab comes in. The website prides itself on being a safe haven for free speech. Users can express just about any opinion -- even ones that would be considered extremely problematic on other social media websites -- with relatively few repercussions. 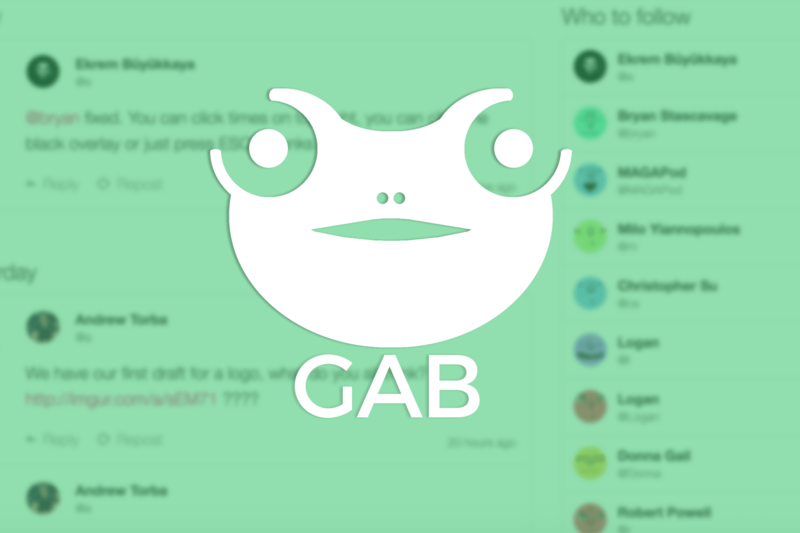 Unfortunately for Gab's fans, the platform was blacklisted by its former domain registrar GoDaddy, as well as multiple payment processors after alleged Pittsburgh synagogue shooter Robert Bowers used the website as a place to post anti-Semitic "conspiracy theories." However, it seems these companies couldn't keep Gab down for long. The social network appears to be back up, thanks to domain provider Epik lending its support and understanding. The company today posted a blog post explaining its decision to work with Gab. To summarize, Epik feels what's happened to Gab is morally wrong, saying "de-platforming" is equivalent to digital censorship, while blacklisting is akin to "digital shunning." Time will tell whether or not Epik's opinion will change, but for now, Gab will live to fight another day. There really should be a new term for free speech in the constitution. Simply having the term 'free speech' makes riff raffs think, "But why can't I tell my boss to go f himself, or call him an n word, or blank my blank? It's my freedom of speech. It's the law of god." Honestly not sure why the title of the article is "Free speech-focused ..." when really it should just be "hate speech/pro racism website that claims to be free speech focussed.."
wiyosaya, mcborge, Clamyboy74 and 2 others like this. Because Free speech is a thing and that other, isn't. H3llion, Zoner1501 and MaXtor like this. Don't like people saying mean things? Don't want to be on a platform that has no content controls? Do what the rest of us do and don't use the platform. Everything else is just advocating for the same anachronistic thought policing performed by the church for centuries. Only different being you've replaced God and scripture with "victims" and social justice. The technology and medium has changed, but it seems the people haven't. Then again, if we never got rid of blasphemy laws, we wouldn't have this problem. MaXtor and kombu like this. 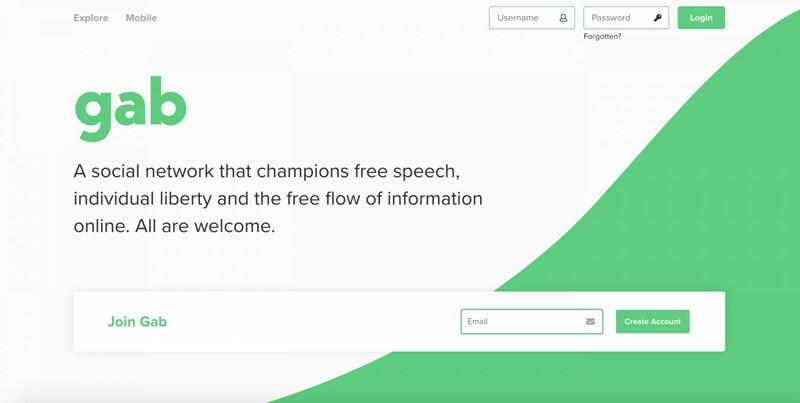 I like the idea of a free-speech focused social network, however the problem with Gab is that it's pretty much the only option at the moment, which means it's very attractive to not only proponents of free speech and anti-political correctness, but the alt-right and countless trolls. I joined when it first launched, however I quickly found it was saturated with either alt-right people or people trolling and saying alt-right things because they can. I didn't find many productive discussions, so I uninstalled the app shortly after. With the mainstream social networks attack on conservatives and people who don't agree with every single thing the far left says, I hope Gab can evolve into something more. Or maybe another free-speech social network will come which promotes open discussions of all ideas, be it left, center, right, or what have you. I don't think Gab is doing anything wrong allowing alt-right discussions like identity politics, the same as they would allow far left discussions like identity politics. I think it's good to allow bad ideas to be discussed so that can be routed out through civil discourse. CanadEan84, Danny101 and kombu like this. I agree with others. There really SHOULD be limits on just what is considered "free speech". The difficult part is deciding where that line is. Gab's solution of allowing just anything is not a good solution. I personally agree with Facebook's simple solution of fact checking. Fact checking sometimes ticks people off but most fact checking websites give a nice little explanation of their findings which is usually proof enough. Unfortunately checking facts is almost a requirement now due to all the twisted news out there. I'm all for free-speech, but let's be entirely honest about the business angle. Optics always play a role. Twitter, youtube, facebook, etc aren't run by activists. They're content with merely getting you to think they are. Shareholders and profits are where their allegiance ultimately lie and understandably so. Freedom of speech may be a popular catchphrase, but racism, antisemitism, homophobia, and hate-speech in general is a far greater concern in terms of reputation and branding. If any mainstream company gets so much as a hint that their brand is being tarnished by those "trolls" you mention, it isn't hard to imagine how easy a decision it would be to simply give them the boot. When all is said and done, only the "trolls" are left protesting. They still have their speech, but it's up to them to figure out how best to disseminate it. Private businesses aren't really obliged to facilitate them. NO! You cannot do that. What will happen if someone starts to water it down, will be someone will "censor" something, then a few weeks, months, years, someone will want to censor something that is "similar" to something previously blocked and little by little it will destroy it. Sadly, you have to put up with the bad, as well as the good. The political correctness "movement" is a prime example of what happens, when you start messing with the freedom of press/speech/expression. You're not understanding my point. It's not watering it down, or changing it, it's finding a term that better expresses what it means. Ten years ago I disabled the comments on one of my YouTube videos, and then I started receiving countless emails about, "What about my free speech?" If the term was something like "Freedom of speech from the government" then morons would not just take the word at face value and somehow feel violated because there's an option to disable comments on YouTube. Another example was back in the 80s, Howard Stern before he made it big. He had these loser neighbors, that just drank and didn't do anything. As soon as they found out he was on the radio they started yelling at him of sorts of things, daily, saying "I HAVE FREE SPEECH, YOU'RE NOT THE ONLY ONE WITH FREE SPEECH. WHAT ABOUT MY FREE SPEECH." And just blasted their radio at night, his direction so that he would be able to sleep. And it makes sense that a ***** is going to look at the words "free speech" and have such interpretations. "....blacklisting is akin to "digital shunning." Gab has a lot of the far right because they have mostly been BANNED from the other platforms. To say gab caters to them is wrong, the audience found gab. I think you're right, to an extent. Leaks and internal videos have suggested a political bias a little beyond that. You're very logical, and I think correct for the most part. One thing to point out however is most of these companies are publicly traded and are therefore public companies, not private companies. Regardless of whether they're private or public, the problem I see is that these companies are beyond massive and in 2018 they have more influence and control over the population than the government. With most of these companies leaning strongly to the left, I find it dangerous to our yin and yang political system (which keeps us balanced and free from tyranny, which happens when a political system goes too far left or too far right). To say gab caters to them is wrong, the audience found gab. I didn't say that, if I implied it, that's not what I meant. Gab has a lot of the far right because they have mostly been BANNED from the other platforms. Free speech is about ideas. It's not about than general verbiage or using vulgar language. If we're honest though, free speech only really comes into play when we're talking about politics and protesting. It's never really much of an issue for other settings, except for causing undue panic (fire in a crowded theater), lying under oath of law, harassment. or use of vulgar language in formal settings including the airwaves. free speech only really comes into play when we're talking about politics and protesting. Free speech is what you're using right now in your comment. Free speech is taken for granted and is used in every part of your daily life. Ask a North Korean what they think about Kim Jong-un or their country, I guarantee they'll all have a very positive answer. Ask a Canadian who believes in biological genders if they think Caitlyn Jenner is biologically a women (their answer would violate compelled speech laws in Canada). Make a joke about Nazis in the UK, watch the context be completely ignored, and suddenly you're on trial for violating the Communications Act of 2003 and being "Grossly Offensive." Right! Just like they don't have a problem with blasphemy in countries where the government enforces sharia law. There are quite a few TS readers, IMO, that have no clue that what you posted is what free speech is about. I bet many of them have never had an original idea in their entire lives. Most of them seem to ruminate on what they have heard and consider truth. To them, it is only free speech if it is consistent with their world view. In all those instances, one group is threatened by the views of another or like I said before, a person's idea. Or what that person believes is right. In the lack of free speech, somebody is trying to protect their ideas from another group, most often his or hers lies from exposure. Free speech is fundamental to exposing lies. Once a society begins to attack free speech, that society is weak and trying to defend itself like an injured lion. Only delaying the inevitable. I don't want to put words in your mouth, I may be misunderstanding what you're saying. Do you think North Korea, Canada, and the UK all have free speech? In North Korea your speech is compelled in that you can't be critical of the government. Canada and the UK aren't anywhere near the same extent, but they've set very dangerous precedents. Their compelled speech laws are based on compassion, while it's nice in theory, it opens them up for more compelled speech. What happens when a party you don't agree with gets into power and uses that precedent to enact their own compelled speech laws? It's a slippery slope. People are offended every day by everything. You can't protect people from being offended. To paraphrase Dr Jordan Peterson: "In order to think, you have to risk being offensive." To paraphrase Dr Jordan Peterson: "In order to think, you have to risk being offensive." I think Dr. Jordan Peterson needs to see a shrink. It doesn't matter what you think. No one will hear you. Its how those ideas are expressed to others that might be a problem. For instance, if you incite violence as part of what is assumed to be your expression of your 1st Amendment Rights in the US and you happen to be charged for it, you cannot claim 1st Amendment protections since SCOTUS has decided that speech that incites violence is not speech protected by the 1st Amendment. In this case, it was the consensus opinion that inciting violence is not a necessary condition for the free expressions of ideas. He's a very well educated clinical psychologist with an extremely high IQ... so... he probably does see a psychiatrist. if you incite violence as part of what is assumed to be your expression of your 1st Amendment Rights in the US and you happen to be charged for it, you cannot claim 1st Amendment protections since SCOTUS has decided that speech that incites violence is not speech protected by the 1st Amendment. In this case, it was the consensus opinion that inciting violence is not a necessary condition for the free expressions of ideas. Right, I don't disagree with any of that. Are you referring to Gab? None of my 3 examples have to do with inciting violence. You seem to assume that I disagree with these notions. I don't. The whole purpose of free speech is to offend. Hopefully, the guilty with the truth. It's why socialists hate free speech. Because socialists are liars. Free speech can be uncomfortable, but I'm a lot more uncomfortable with giving anyone the power to decide where that line is. Society is really great at self-balancing. If someone has horrible ideas, not many come to the talk, or buy a book etc. We reward good ideas with our patronage. People need to stop being so lazy and trying to censor ideas they don't like, and construct ideas that properly counter bad ideas from their perspective. The only way to counter a bad idea is with a better idea. We need more speech, not less.